The Lac des Iles mine is a conventional open pit operation, using blasthole drills, shovels, and haul trucks to supply ore to the mill (rated at 15,000 tonnes per day). In 2002, total production from the Lac des Iles open pit amounted to 17.1 million tonnes, or 46,793 tonnes-per-day of combined waste and ore. This compares to 24.9 million tonnes mined, or 68,336 tonnes-per-day in 2001. Lac des Iles Mine is a major low-cost producer of platinum group metals. Dedicated to continual growth, the company has recently expanded its mining operations and shows a continued commitment to local and global PGM exploration and development programs. The mine is located 100 km Northwest of Thunder Bay. It is a camp setting with accommodations provided. North American Palladium is committed to conducting its operations in an environmentally responsible manner and to providing a safe and healthy working environment for its employees. The success of our Company has been fueled by the entrepreneurial culture of NAP, where every employee has the opportunity and potential to make a difference in our operations. Our vision is to become a low cost mid-tier precious metals producer and we recognize that the innovation, skills and dedication of our employees are what empower the Company to achieve its goals for growth and success every year. Employee collaboration and innovation empowers NAP to achieve its progressive goals for growth every year. Employee contribution and entrepreneurship is encouraged. Individuals are respected for their ideas, and granted accountability for their work. Our scale of operations and team-oriented culture offers individuals the chance to bring ideas into action. We are looking for people that are committed, passionate and focused on achieving operational excellence. At NAP, hierarchy and bureaucracy gives way to teamwork and collaboration. As a result, the ideas and skills of each individual make tangible contributions to company accomplishments. Having a say in the decision-making process is one of the many benefits of working for a growing and entrepreneurial company. 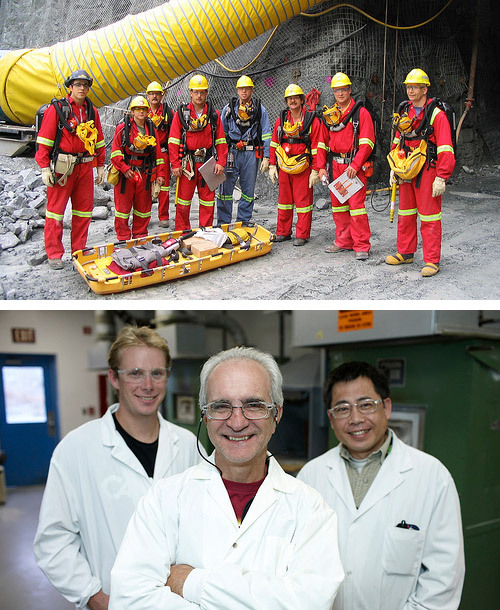 NAP operates in Canadian mining-friendly jurisdictions, with a keen focus on corporate governance, ethics, and the well being of every employee, making it a safe, professional and rewarding place to work. Our commitment to workplace safety, mutual respect, and the wellbeing of our employees is, and always will be, our top priority. Safety is at the forefront of everything we do. We also encourage employees to excel in their work by providing the technical training and support to succeed, and credit them with fair compensation and benefits. Through a major mine expansions and significant exploration upside, we plan to significantly increase our palladium production while lowering our cash costs per ounce, transforming LDI into a long life, low cost producer of palladium. Our significant commitment to exploration is backed by a $16 million exploration program and a $116 million capital budget for the LDI mine expansion in 2012. NAP’s commitment to growth offers the opportunity for your career to advance. North American Palladium is committed to ensuring a safe working environment for all of our employees. Our operations have a Loss Control Department, implementing a formal health and safety management system. The department is typically comprised of a Superintendent, a Health & Safety Worker Advisor and Loss Control Coordinators. Senior management is committed to health and safety in order to achieve the desired knowledge transfer and emphasize the importance of safety to supervisors and front-line employees. Active Joint Health and Safety Committees (JHSC) comprised of management and unit representatives are expected to jointly examine workplace issues relating to safety and potential risk. Participation in groups such as the Mines and Aggregates Safety and Health Association (MASHA) is necessary, to maintain awareness of issues and events relating to safety throughout the Mining industry. Being prepared in the event that an accident does occur, allowing appropriate response and prevention of recurrence, as all accidents are thoroughly investigated. Ensuring that our nurses provide care for non-work related health concerns as well as providing assistance in the event of a workplace injury. These nurses champion wellness programs such as weight-loss, healthy eating, and smoking cessation. The Employee & Family Assistance Program looks beyond the workplace to provide assistance to workers and their families in dealing with issues that may be affecting their lives outside of work. Our dedicated team of managers and supervisors who make safety an integral part of each workday. Our Joint Health and Safety Committee, focusing on identifying safety concerns and making improvements. Crew safety meetings held to address worker concerns and communicate safe work issues. Procedures that are developed and communicated for activities that may have related hazards. A fully-trained Mine Rescue team is available to respond to any emergency situation. Use of the Common Core modular training system at both the Mill and the Mine. Alliances with groups such as FM Global and the Electrical Safety Authority who inspect our facilities to provide insight into any opportunities for improvement. 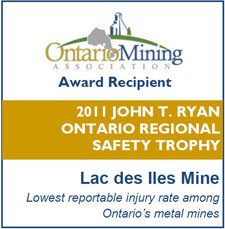 In recognition of the Lac des Iles mine's outstanding safety performance in 2011, LDI has been selected by the Ontario Mining Association as the recipient of the 2011 John T. Ryan, Ontario Regional Safety Trophy in the metal mine category. The award recognizes LDI's safety excellence demonstrated by all employees throughout 2011 who achieved the lowest reportable injury rate among Ontario's metal mines. North American Palladium recognizes that environmental management and the protection of the environment are among the highest corporate priorities at all stages of our operations. Recognizing environmental management as one of the highest corporate priorities, and integrating these considerations into all mine operations and closures. Monitoring environmental performance through vigorous testing and identifying areas for improvement. Instilling the ethics of environmental awareness and responsibility through education and communication with employees, contractors and suppliers. Remaining current with permitting and licensing requirements, any changes to environmental regulations and evolving government guidelines. Working to minimize the effects of mining with the goal of restoring disturbed areas and ecosystems to wildlife/recreation Crown land use. Ensuring that each operation has a formal environmental management system. Providing adequate and appropriate resources to ensure environmental compliance. Identifying the potential for accidents, while maintaining emergency response plans in order to prevent and mitigate the environmental impacts that may be associated with them. Temporary Heavy Equipment Operator 2, Lac des Iles Mine, ON, Canada Hot! Miner 2 - Development, Lac des Iles Mine, ON, Canada Hot! 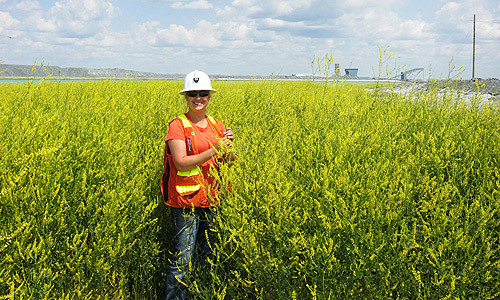 Production Geologist/Geology Technologist, Lac des Iles Mine, ON, Canada Hot! Cost Accountant, Lac des Iles Mine, ON, Canada Hot! Junior Core Technician, Geology, Lac des Iles Mine, ON, Canada Hot! 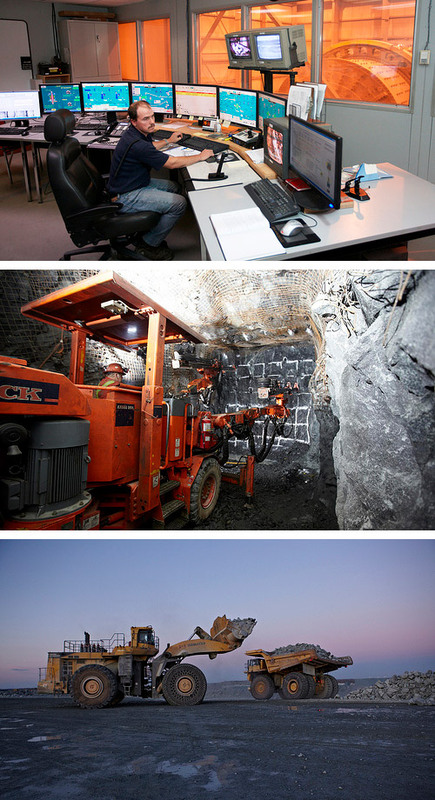 Human Resources Generalist, Lac des Iles Mine, ON, Canada Hot!